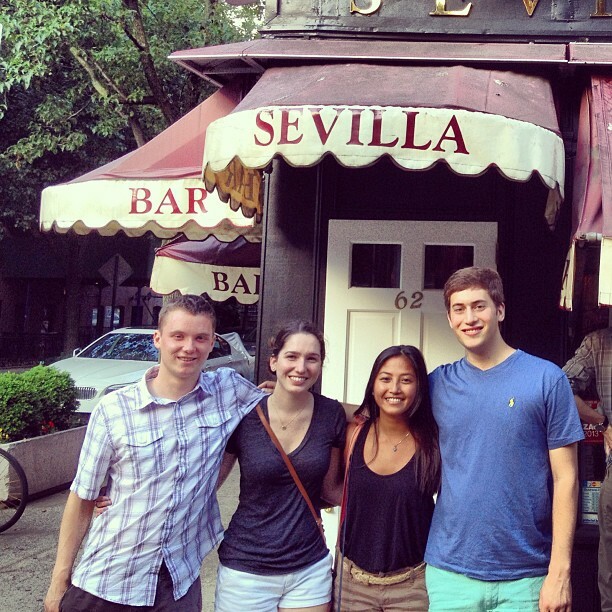 This past weekend, I met up with some friends in New York City where we had a mini Sevilla reunion. I was so impatient and excited on the train ride into the city I found myself smiling while looking out the window, and all the way until I reached Herald Square, where I found them. Initially I figured that everyone who passed me thought I was crazy, and then I remembered I was in New York City, and everyone is crazy. When I saw them sitting in the sun in the middle of Broadway, my heart leaped and at that moment I knew my smile wouldn’t be going away for a while. We spent the day reminiscing about the time we spent together while abroad, and we also spent it making new memories. Study abroad friendships are like no other. And when I say no other, I mean no other. These relationships form extremely fast and you learn whether or not you are able to trust a person very quickly. They form so fast that withdrawal is often a symptom after separation. Take for example a certain someone (No, not me. But this is a true story.) who booked a one way flight to a certain somewhere across the country to visit a certain friend from abroad–and we’ve only been home for a month. Hours of traveling and finding adventure together make it so that everyone’s life story is told at one point in the semester. I know all about my abroad friends’ past and present relationships, friendships, families, school-life, and home-life. I know about their schools, what they want in the future, who their celebrity crushes are, etc. etc. With time, I get to know for myself what their comfort zones are, and breaking out of ours together is one of the best things about being abroad friends. We grew, and continue to grow together, and towards each other. From the first awkward introductions we had at orientation to the depressing goodbyes and sobs we shared on our last night together, it has been quite the ride. If I were to tell the honest truth, sometimes I feel closer to my friends from Sevilla than I do to some of the friends I’ve had since I was ten. The things a friendship goes through in Sevilla (abroad in general) are magical, and I couldn’t be happier to have these people in my life. Spending 5 months in Spain, in a new unfamiliar city, with people who began as strangers has had a big impact on me. It showed me just how quickly you can let someone in. There were plenty unbelievable love stories about students who fell in love with locals; students who ended up changing their flight to stay longer, and locals who came to visit their significant others Stateside. It’s incredible. Until January 27th, I had no idea of the existence of these people who I now talk to on the daily–people who I couldn’t imagine my life without. I’m so lucky. To think that just a few months ago our paths had not yet crossed seems almost impossible. Why impossible? Well, impossible because the last few months would have been completely different. Who knows if I would have been this happy if it weren’t for the people who gave me the reasons to be? Once I got on the bus to the airport at the end of the semester, I knew that no one would know what I meant if I said “Ah-Pee”. No one would accept the excuse “Sorry I’m on Spanish time” if I was late. No one outside of our group would understand my craving for a jarra of tinto, or a Cruzcampo. No one would know much of any of the things I wanted to talk about. Someone I know who studied abroad warned me about coming home. They said, “Just be prepared for no one to really care about your stories.” Um…ouch? That was a little rude. It stung. And the sting lasted for a while, because it happened. People asked what my craziest story was or what my favorite part about being abroad was. But no one listened or wanted to listen to the simple things that made my semester beautiful. They didn’t ask how many sunsets I watched in how many countries, and what songs we listened to during those sunsets (Love Like A Sunset Part II by Phoenix just by the way…). They didn’t wonder what Tuesday nights were like at Alfalfa. They didn’t have questions about my friends and what they were like. And they definitely didn’t think that I had a favorite tree in Sevilla that I cared so deeply about. They just didn’t inquire about any of those things. Then one day I realized. It was our little slice of life together that I’m really okay with no one else knowing about. You know what they say. Lo que pasa en Sevilla, se queda en Sevilla.